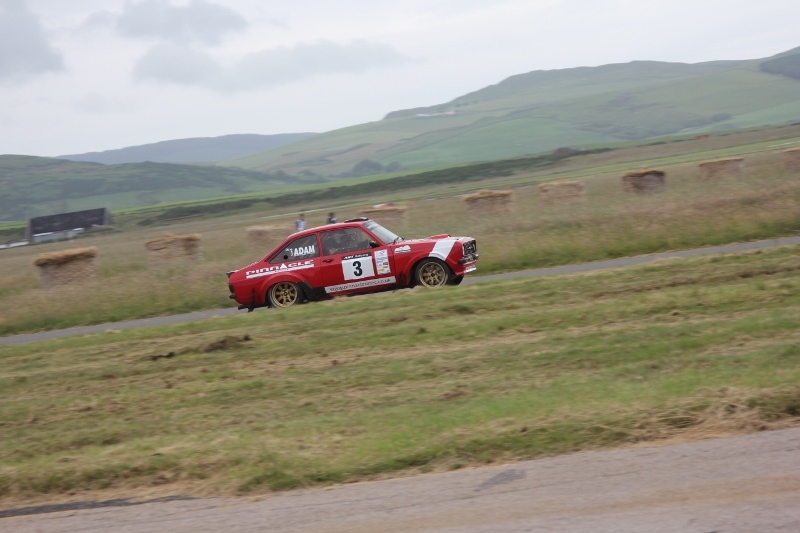 The first day of this year’s two-day Mach1 Stages Rally at Machrihanish had everything, from bale bashers to fence smashers, from tyre shredders to metal fatiguers, and even a dash of fire and flood. In fact the only things missing were an infliction of plague and pestilence. Bearing that in mind, Gary Adam, finished his day in the Mk2 with a six second lead over the Lotus Exige of Alistair Inglis. Two rear wheel drive cars ahead of the four wheel drive cars of Tom Morris and Colin Gemmell. Given the fact that the last four stages were wet and puddled, that might come as something of a surprise. According to Adam it was all down to the right tyres, and yet his heated windscreen wasn’t working and the car was misting up. So his pace was quite mesmerising in those conditions. Nobody was more surprised at Inglis in second place than Alistair himself. He was struggling with a new Quaife gearbox in place of his much loved MakTrak unit but he is getting the Lotus sorted more to his liking these days. As for Morris, he had three spins in the Metro on the very wet fifth stage: “Two monster spins, and one normal spin – wrong tyres” he said. Gemmell’s Subaru was on the pace too and he was closing the gap on the leaders as the rain fell harder. And that was the story of the day, the first four stages were mostly dry and then it started to rain, ending the first day wet, with huge puddles of standing water (floods) everywhere, and that’s where the fire came in. Ross Fernie smacked a bale, split it open and it caught fire. Seeing flames leaping high in the air and huge plumes of smoke out in the middle of an airfield was a worrying sight. However the crew were OK and the Subaru had a sore nose, and the fire was put out. There was another surprise in fifth place with number 32 seed David Ross in the DAM just 10 seconds clear of the Mk2 of Ian Woodhouse.